Philips Sonicare has taken an oft-parodied feature — Bluetooth — and baked it into their popular electric toothbrush. To our surprise, it actually added a wealth of features and greatly improved an already fantastic product. It seems that these days manufacturers are needlessly shoving Bluetooth to everything they can get their hands on. There are even Bluetooth toilets. Of all the different accessories that have had Bluetooth squeezed inside, one we never expected to appreciate was our toothbrush. Let's uncap the toothpaste and start brushing. Sonicare has a long history as being arguably the best electric toothbrush lineup out there, with several different models available at various price points. The lineup is a bit confusing, with only minor differences between each of them. Sitting squarely at the top of the lineup, however, is the DiamondClean Smart, which happens to be the model we are reviewing here. Specifically the 9300 model. That leaves the 9500 and 9700 series with a few additional features in tow, which we can touch on later. First and foremost, this is a toothbrush. Nothing else matters if it brushes your teeth as well as a finger with toothpaste does. Fortunately, that isn't the case, and Sonicare DiamondClean excels in cleaning teeth. It has four different brushing modes —Clean, Deep Clean+, Gum Health, and white+ —to help with whatever your primary goal is. Sonicare toothbrushes vibrate, rather than rotate, and they do so amazingly fast. That tiny motor in there is capable of moving the brush head 62,000 times a minute. It features the same "QuadPacer" tech we've seen in Sonicare's offerings for years, which automatically pauses every 30 seconds to let you know to start cleaning a different quadrant of your mouth. This helps when not using it with the app to be sure you are spending equal time in all portions of your mouth. Each brush head for the DiamonClean Smart has a tiny chip at the bottom. This is read by the toothbrush when attached, and can help with different aspects such as when the brush head needs to be replaced. There are several different types of brush heads, each with a specific purpose. When the brush head is identified by the handle, it will automatically switch the cleaning mode to best optimize your brushing. For instance, G3 Premium Gum Care brush head will pair with Gum Health mode. It also is able to tell when you push too hard on your teeth or try to scrub, but which could hurt your enamel. These are two serious concerns with electric toothbrushes, that (evidently) are all too common. When the brush lights up purple and vibrates the handle, it should help people stop the destructive brushing. 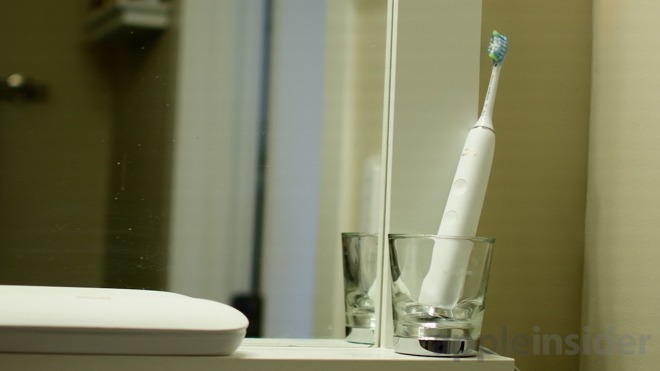 Bluetooth connectivity allows the toothbrush to connect with the corresponding iOS or Android app. It offers several additional features that make it more powerful. When you first launch the app, you let it know what you are concerned about, and it will give you a cleaning mode and brush head recommendation based on that. It also provides a 3D mouth view, showing you where you are having issues cleaning. It can show you averages of this cleaning over time, so you can see how you are improving. This is helpful, especially if there are areas where you are constantly missing. 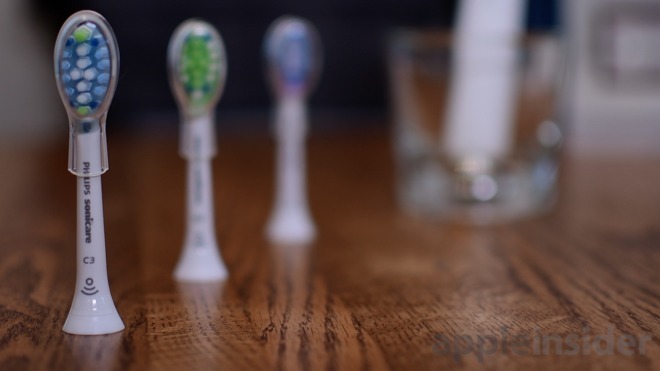 While brushing, the app guides you through different parts of your mouth, very granularly. It will give you guidance such as as back right exterior, then interior, then front exterior, front interior, and so on. Once you finish, it offers a "touch up" mode, where you can go back and hit the areas you didn't adequately brush. If you have a specific problem area that you want to focus on, you can set this within the app. It will then allocate a bit of extra time for it, making sure that it gets the focus it needs, while not neglecting the rest of your mouth. 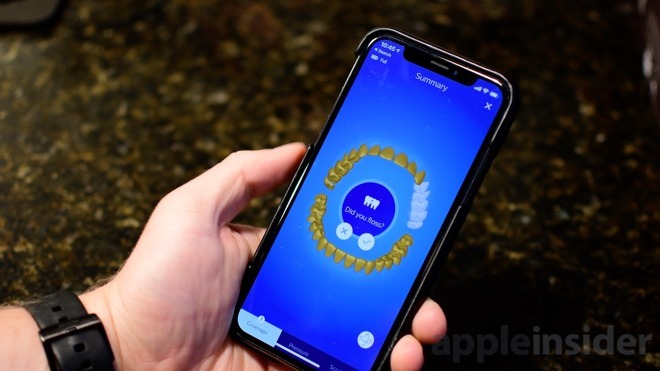 Once you've finished brushing, the app gives you a 3D overview of your session, and asks you if you've flossed, rinsed, and scraped your tongue. It then logs all your progress on a calendar. If you so choose, this can be exported for your dentist so they can see how you've been doing. Sonicare DiamonClean's built-in battery will last fourteen days from a full charge, with two brushing sessions each day. To charge the toothbrush, it just needs set on the charger, which in this case takes the shape of a small glass. 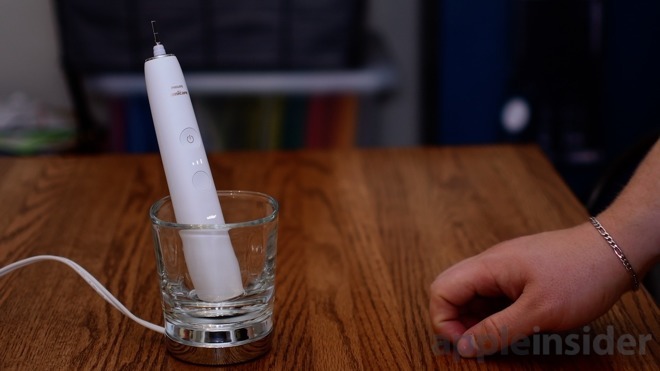 This small glass sits atop an inductive charger, which then charges the toothbrush through the bottom of the cup. It works amazingly well, and looks pretty great sitting on your bathroom counter. We will say that while it looks great and all, we rarely ever actually wanted to use the cup to drink from. It got a bit dirty after time from placing the toothbrush in it, we instead just relied on it for charging purposes. A two-week battery life after a charge should be plenty for most bouts of travel, though if you are going to stay away longer than that, you will have to plan accordingly. DiamondClean does come with a handy travel case, able to fit the toothbrush as well as two brush heads. The outside has a nice soft finish that is easily gripped. It is also slim, allowing for an easy fit into our bags. Not only does this case keep your toothbrush clean, and toothpaste off your clothes, but it prevents the buttons from triggering and turning on in the car or on your flight. Our 9300 model comes with a plain case, though the 9500 and 9700 both ship with a USB case that will help charge the battery life when on the road. For frequent travelers, this is a worthy investment. There are three different models of the Sonicare DiamondClean Smart. The 9300, which we've reviewed. We already mentioned the 9500 and the 9700. When comparing, the 9500 has everything the 9300 has, but the charging case also has the built-in wireless charging for on the go. It also has an extra cleaning mode — TongueCare+ — and a TongueCare+ brush head also included. The premium 9700 has everything the 9500 has, but adds the exclusive "lunar blue" color, and comes packed with a year's worth of brush heads. Instead of three brush heads, you get seven. The best model in our opinion would be the 9500. It isn't hugely more expensive but comes with a better case and the tongue cleaning mode/brush. 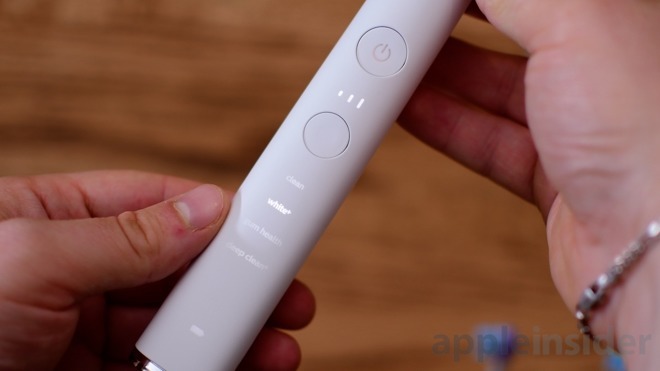 Philips isn't the only big player to add Bluetooth to their electric toothbrush. Colgate added it to their model, which is available exclusively in Apple Stores. 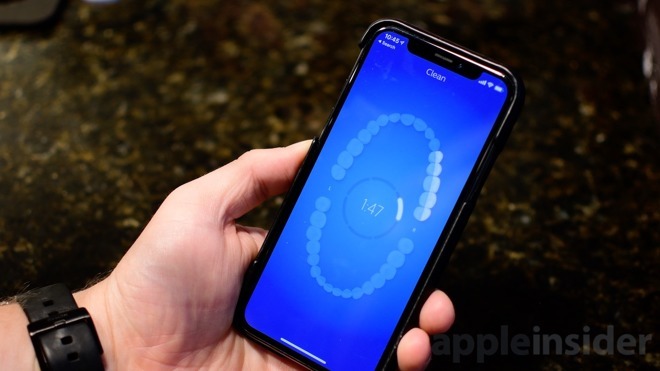 It, however, offers a far worse experience overall, with the only different feature is the integration with ResearchKit to help improve brushing for everyone. Like we said at the onset, Bluetooth was a surprising positive to have in our toothbrush. It legitimately offered useful features that improved our brushing experience. Dental services can be quite expensive which means ponying up the money for a great toothbrush can be an investment that will save you in the long term. 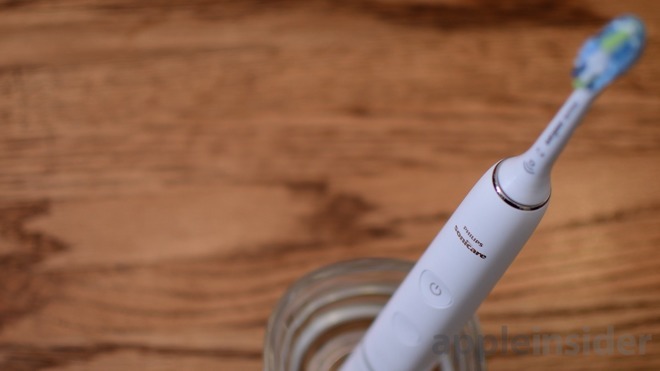 If you already have a Sonicare toothbrush, it is hard to justify spending quite this much just for the addition of Bluetooth —although it is tempting. If, however, you don't yet have an electric toothbrush, we would without a doubt recommend the Sonicare DiamondClean Smart. To pick up the Philips Sonicare DiamondClean Smart, you can find them readily available on Amazon. The 9300 will run you $170, while the 9500 will run you $231 and the lofty 9700 in lovely lunar blue will set you back $279.